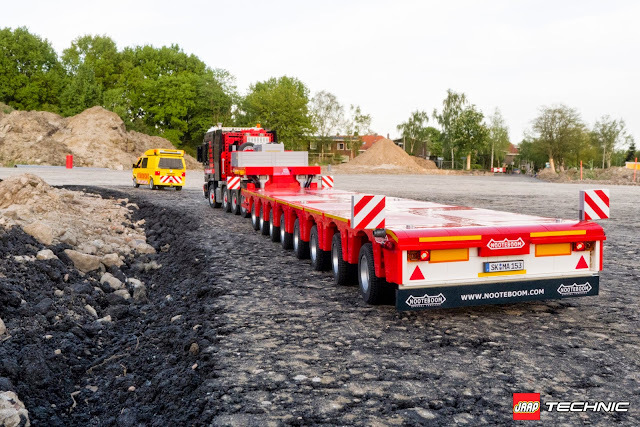 After a few tries with other trailers i found out that lego can't handle the stretched length of a low loader without doing concessions in the external design of it. When i build an model, one of the main rules is to keep the external design the same as the real machine. So there was only one option left, to build an Semi-trailer. This trailer has tires which are rather small compared to the truck and the load is spread over all the tires and located higher than the tires. So i started with building the Nooteboom MCO 121 8 Axle semi-trailer. I had plans to get te steering mechanism work and maybe even automatic. With official Lego bricks there are 2 options to get it working automatically. The first option uses mechanical constructions which are connected to the fifth wheel of the truck. This is hard to create when the gooseneck of the trailer can tilt and almost impossible to power 8 axles when the trailer is loaded. The second option uses PowerFunction parts which measures the steered angle of the trailer compared to the truck and automatically controls multiple servo motors based on this angle. 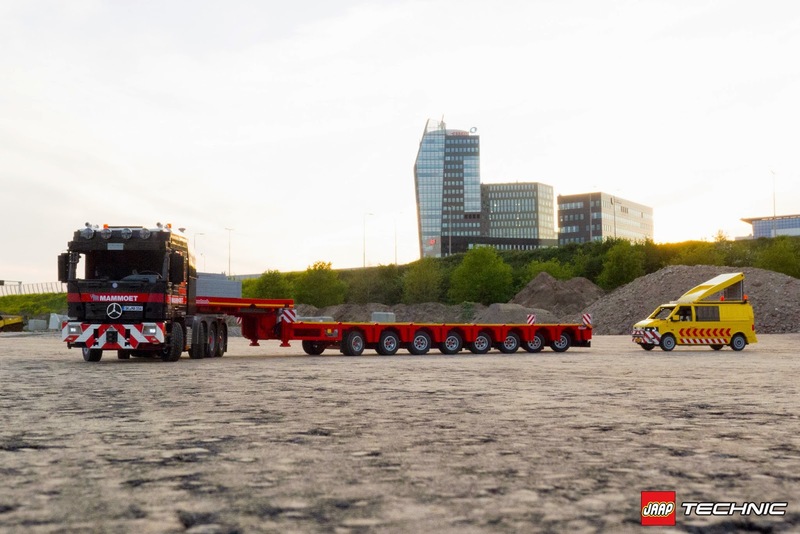 With both options the steering angle of the trailer is not the same as the front axles of the truck, that is exactly what is needed in this situation. Finally i have chosen the second option because this option allows me to haul large lego models and the steering keeps working in this conditions. After a few tries with different setups for the electronic steering mechanism i was out of options and the project was almost failed. At that moment Huib van der Hart, a good friend and also professional Lego builder, said he maybe knew one final option. I shipped the trailer to him and he started working out his plan. After a few weeks he said, Yes! it's working, I was like nooop, that's not possible, but he did it! A truly master piece inside this trailer controls this 113cm long trailer trough any corner without any help. Huib van der Hart isn't used to build models ready for building instructions so the whole trailer is rebuild by me to reduce the part count and to increase stiffness. I finally added some more details like outriggers and designed all the stickers including yellow reflective striping all around the trailer. 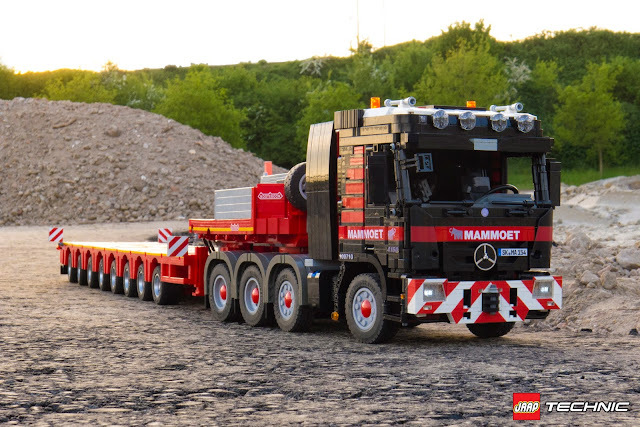 Warning: You may have a hard time recognising the Lego bricks in this model! But it's pure Lego! I'll be waiting patiently for the plans!!! Hello, I have recently purchased the building instructions of Actros 4160 and found that the wheel fenders in the instructions are different from the ones in the pictures above. Do you have the parts list for the wheel fenders or better yet, building instructions (fenders only) that will enhance the existing building instructions of Actros 4160? realy good Stuff... "full respect"
The steering of the Nooteboom works with 1 servo motor too. But when using less servo motors, the steering function will be weaker. So more power = more load accurately steered trough the corners. My advice is to use at least 2 servo motors. Good luck with building it! It is greater than 1:50 die-cast ? 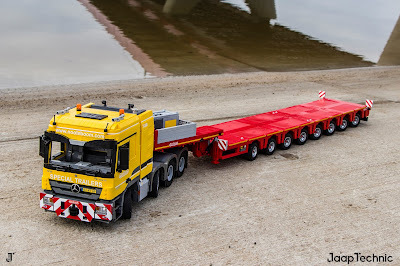 This trailer is build in scale 1:16 which means the whole truck + trailer is about 1,5meter long. Almost all my models with building instruxtions are build in this scale except the Land Rover series and Baja Trophy Truck. Kan je de notenboom ook achter de technic set 8253 maken? Above the video on this page there is a link to the Webshop. There you can find the instructions for the Nooteboom as a download. Building instructions are going to be send by email within 24H after the fees are payed. buddy of mine has allready build it. But i´ve got one question ; my Bubby tell´s me that there is a reduktion of 1:2,5 from the Kingpin to the Accu-box ( and because of that also to the Servo´s ) why is it THAT much ? - it means that the kingpin can rotate about 225 degree´s to let the Servo make 90 degree´s. Did you test it with a reduction of 1:1,5 or without any reduction ? That's a huge trailer can carry a lots of weight. I think the wheel engineering is the most exciting feature on that trailer. Ik ben benieuwd of de bouw instructies voor de Mammoet Liebherr LTM 11500 er al zijn? Wil deze kraan graag bouwen. Sure! The LTM 11200 is indeed an awesome model. 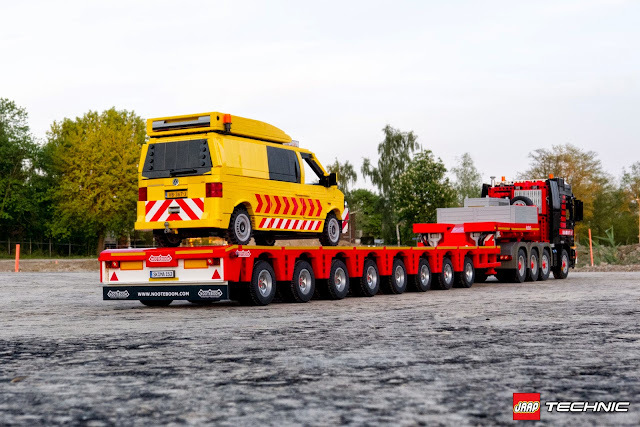 But did you know such a large model will cost around 7500€ for the bricks only! Thats the main reason we didn't made a building instruction for it. Not even talking about the many years of work needed to create the building instruction because its so gigantic. Thanks for your interest though. 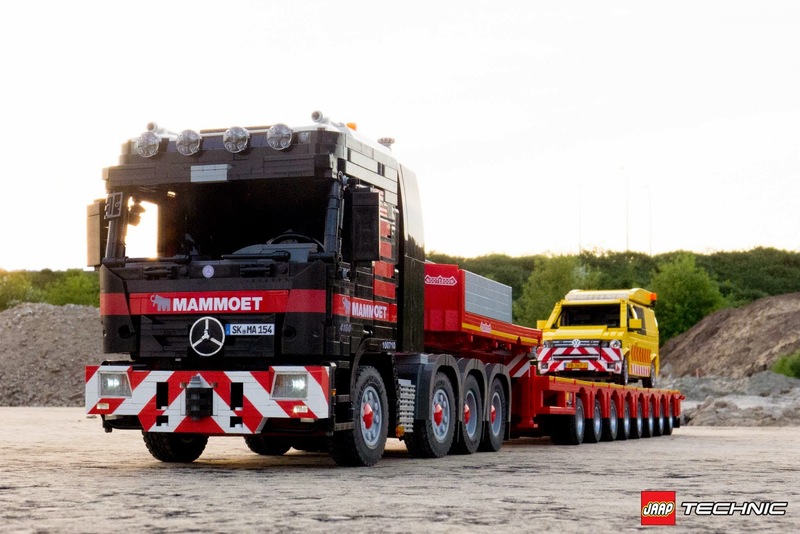 Wil MAMMOET de LTM 11200 niet overnemen? Sure! But its a little overrated to use a SBrick for the rear lights only. Since the trailer steering system is NOT connected to this IR receiver / Sbrick. Only the rear lights are. If you leave out the rear light you can leave the IR receiver / SBrick out too.